If you’re like most people, you probably think you don’t have enough time in a day to do everything you want. I’m not surprised – after all, productivity is now the latest trend. We all want to squeeze as much as we can out of our days, but still wish it has more hours. We even force to make it happen by taking away a few hours from a night. But do we really need more time in a day or should we make better use of time that we already have? Do you sometimes have the feeling that there are people who do much more work than you without working over hours? They’ve all their job done, they’re never in a hurry and still have time to talk with their teammates. How do they do it? What’s significant for productive people is that they plan their activities and prioritize them, because what doesn’t get scheduled, doesn’t get done. So they schedule their projects on a daily and weekly basis. You would be surprised how much you’re able to do when you actually plan everything and stick to it. While planning is the main key, productive people don’t stop just there. They monitor their progress on key objectives and iterate their plans, based on results and lessons that they’ve learned. They also tend to use apps to organize their work, communicate with their teammates, boost their mood and even to relax after work. Let me guide you through a casual work day and show you which apps are used by productive people, to make their day more effective. “The trouble with not having goals is that you can spend your life running up and down the field and never score.” This quote, from Cricket umpire Bill Copeland, shows how important it is to create goals if you want to achieve something. And then as Richard Branson recommends: “write it down.” Write down all your ideas, long and short term goals. Simple because it’s easier to execute what’s written. Otherwise, it just ends with talking. 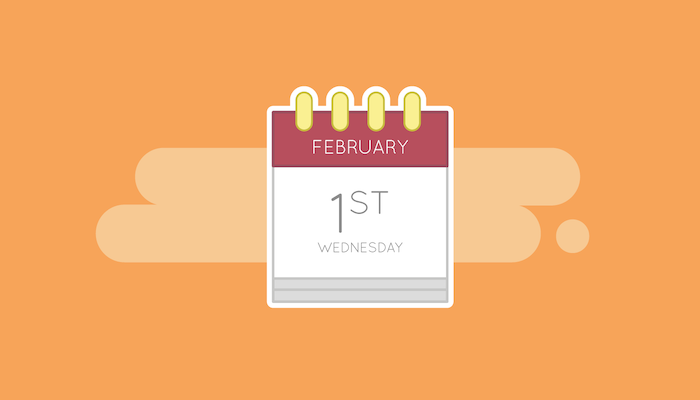 Besides annual goals (which most of us set up at 31st of December and forget about the next month), it’s wise to set up weekly and daily goals as well. But remember to make your to–do list realistic. As productivity expert Cathy Sexton says: “We often bog down our to–do lists and make them not feasible for us to accomplish [plus] we underestimate how long it’s going to take us to do something.” You need to prioritize tasks to focus on for the day and add other tasks as they pop up throughout the day to separate lists, readjusting your priorities if required. At LiveChat we have weekly meetings on Monday, where our content team share what we’ve accomplished in the past week and what are our goals for the next one. This kind of commitment helps us stick to the plan and execute more tasks. When it comes to an individual work, I usually start my day with checking emails, or writing a few sentences to my articles before I even check my social media. When I get to the office, I open a Wunderlist to see what I have planned for a day, beside big tasks I always have in mind. Wunderlist is an easy to use app in which you can write all your tasks, divided by categories like work, family, travel. What’s the most motivating is that when a task is done, you mark it off on the app, the tasks disappears and you can see the tower in Berlin. You may think: “ok, today I want to see the whole tower,” so you do your best until you mark off all the tasks. Besides, you can create a reminder for tasks, prioritize them with numbers, tag them with a star and share your list with other people, which is very useful if you work with a team. It’s also worth noticing that Wunderlist looks great on iOS. Well, I guess that there’s nothing else to do than to get to work and start crossing things off the list, right? If you work in a team, you know that communication is a key to success. It doesn’t matter if you work from different countries or in the same office, you need to contact your co–workers to make things happen. Slack is an absolutely brilliant app when it comes to communicating with your teammates. It gives you a centralized place to communicate with your colleagues through instant messages and in chat rooms with your project teams. It reduces the time that you have to spend using email. 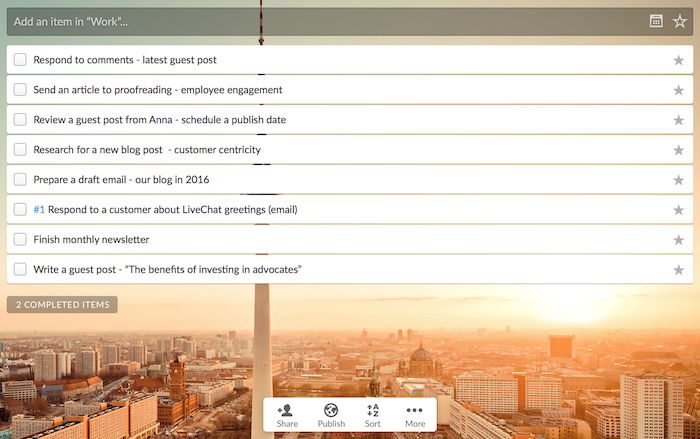 At LiveChat, it’s a central place for communication. We have channels like general, marketing, content, creative department but also “running”, where people can arrange their group trainings and motivate each other. Also, when you’re out of the office and want to keep up to date on everything, you can easily use the app from your phone. Slack brings people together, which is good but it also might be distracting. When ping pong tables or darts used to be a place where people meet for a break, Slack makes the workplace itself like a break sometimes. For example, it connects seamlessly with an animated search engine called Giphy, for discovering and sharing GIF images. You just plug in a keyword (e.g. Friday) and enjoy related GIF, which is a lot of fun. Luckily, when you want to disconnect, you can snooze the notifications and focus on your work. If you only have enough willpower to use Slack wisely, it will help you a lot. Instant messages rock! When apps became a popular thing, people created them almost for everything, mostly to make our lives easier and more fun. So later, when we spent too much time on these apps, they had to come up with apps that block the “fun ones,” so we can focus on our work again. For example, do you ever catch yourself checking Facebook while trying to do your work? And you don’t have a strong will to prevent yourself from doing it? Luckily there’s an app for that. It’s called Cold Turkey and it lets you temporarily block these distractions so you can focus on finishing your work sooner and make you and your boss happy. The app is flexible and it’s difficult to circumvent. You can set it to block anything from a specific webpage to the entire Internet. You can also allow exceptions, block application, or even use it to lock yourself out of your computer! The app still lets you schedule breaks between work periods to help you recharge. So, which pages prevent you from doing your work? We all have colleagues who don’t remember passwords to their accounts. They even write it down in a notebook but never know where they have put it. I’m this person from time to time. I hate it when I want to log in to an app we use at work and “the login or password is incorrect.” I try again few times, and I always fail, so I need to go through the whole process of “forgot your password? Click here” and then I need to create a new one. The whole process might only take 5 minutes but always irritates me. Luckily, somebody in our company came with an idea to use 1password. It’s an app where the whole team can collect passwords in one safe place. 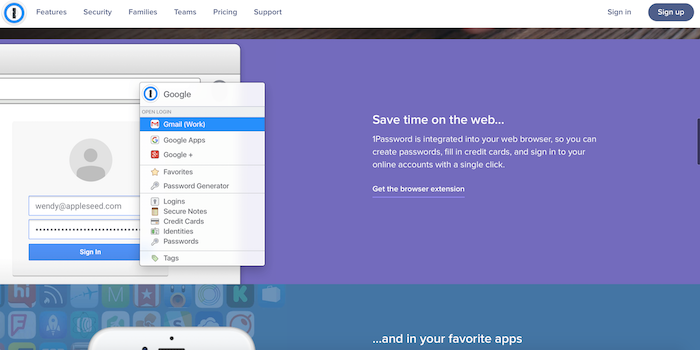 You log in with a single click and you don’t have to remember your passwords again. You can also securely share items and documents with other team members. How easy is that? People have different needs when it comes to the work environment. Some of them need total silence in order to focus, while others need to be stimulated from outside to be able to do their work. No matter if you need to disconnect from the office noise or you want to boost your mood, Spotify is the app for it. With Spotify you can create playlists that suit your mood and share them with your friends. You also can follow other people’s accounts and use playlists created by them. For example, search for “productivity” and you’ll find some suitable playlists. 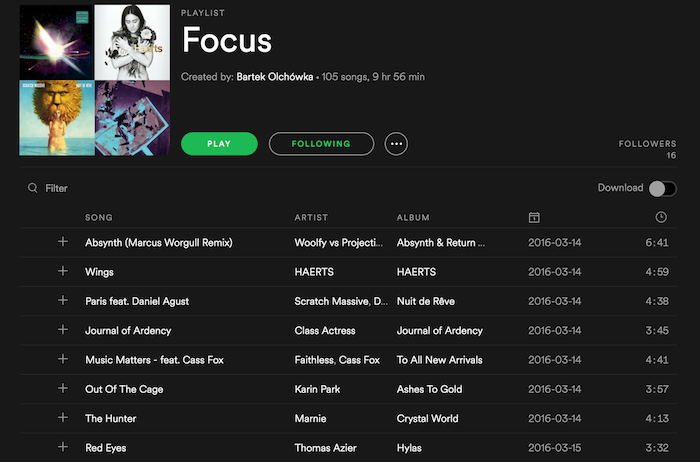 I can recommend you the “Focus” playlist from our CTO, Bartek. It contains both slow and faster music and allows you to work focused for a few hours. I was surprised it worked for me since I’m a person who mostly needs silence to concentrate. That’s why it’s worth a try! You won’t be effective at work without making breaks. Recently, the Draugiem Group, a social networking company, used the time–tracking productivity app DeskTime and conducted an experiment to see what habits set their most productive employees apart. What they found was that the 10% of employees with the highest productivity surprisingly didn’t put in more time than anyone else. In fact, they didn’t even work eight–hour days. “Turns out, what the most productive 10% of our users have in common is their ability to take effective breaks. Specifically, the most productive people work for 52 minutes at a time, then break for 17 minutes before getting back to it,” – said Julia Gifford in The Muse. Why are they able to get the most done during the comparatively short periods of time? They treat their working periods as sprints and make the most of those 52 minutes by working with intense purpose. After that they can enjoy a nice break to be ready for the next burst. There are a lot of “break reminder” apps, I guess you need to choose the one that suits you best. I can recommend “Stand Up! The Work Break Timer”. It’s a fun and flexible break timer that lets you set when your work day starts and how many breaks you want to take. 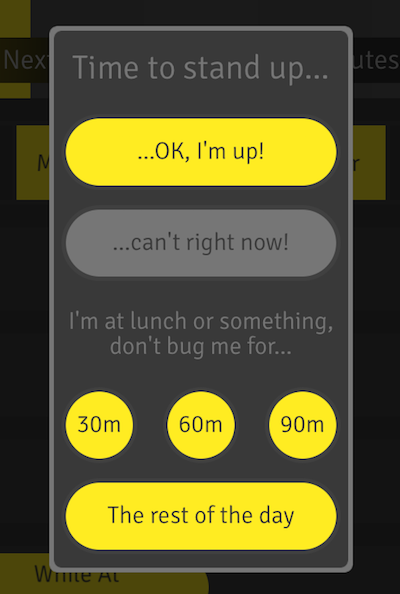 You can limit alarms to your office location so it doesn’t bug you when you go out to lunch. So, do you think it’s about time to stand up? “What? Isn’t the whole point of a break is to do nothing? !” Seems obvious, right? Well, think about what you do when you’re not supposed to do anything. You probably sit on a couch and scroll through Facebook or Instagram on your phone. If you work at the office, sitting and staring at your laptop the whole day, this kind of “break” is no break at all. Because you don’t rest! On your breaks you can do a lot of things that will relax your mind and body. Let’s say you eat your lunch on a break. Why don’t you do that outside to get some sun and fresh air to boost your mood? Leave the phone and talk to your colleagues. This way you ease your eyes, stop thinking about work for a bit and just… relax. It’s the natural things that will calm your mind. Remember, interacting with electronic devices isn’t natural at all. You can also go for a walk – to stretch your legs and clear your mind by turning on a podcast for example. Being in nature is relaxing and a short walk during work increase productivity. Read how two, daily 15–minutes walks during work have increased a company’s productivity by 30%. Don’t be bothered by people who think you’re just killing time and hang out outside. Sitting the whole day at the office never boosted anyone’s productivity. Plus, it’s better for your mind and body than 5 minutes with a cigarette. I hope I convinced you to take “productive breaks.” When you are looking for an app to listening to the podcast, I recommend Soundcloud. When you read the comments to an episode later on, it makes you feel to be a part of a community containing people who enjoy the same thing you do. It won’t be a solitary experience anymore. 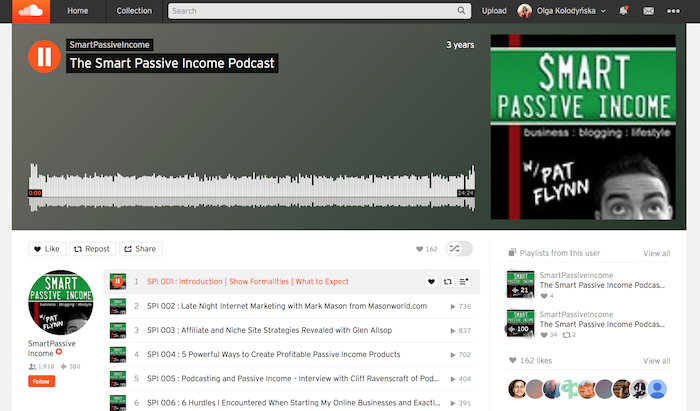 We also invest time in this powerful medium and create our own a podcasts called “Business Sidekick”. Check it out, it’s managed by Justyna. Being productive at work doesn’t start at the office. You need to prepare sooner, and by that I mean the day before. The way you spend your evenings have an impact on how you sleep, how you feel in the morning and your performance the next day. After work, I recommend sport (using Spotify while you’re at the gym to boost the energy with music), but you can also try meditation to relax your mind. Meditation can help you find that inner peace in a noisy online world. It helps you to disconnect, find the balance, be stressed less and even sleep better. You won’t be productive if you fight with your health or your closing eyes. Headspace is a great app to relax your body and mind. With Headspace you can practice the basics of meditation and mindfulness. You have 10 sessions of 10 minutes, and once you finish a session the next one unlocks. The actress Emma Watson said: “It’s an app that teaches you how to meditate. It’s kind of genius.” Headspace has been built on creative collaborations. They partnered with Huffington Post, Twinings, Virgin Atlantic, The Royal Park Foundation and Selfridges. As one of the App Store users said: “I never thought I’d be able to meditate. Not only can I meditate now, but this app has actually cured my long suffering insomnia. And I agree with that. I just finished my 4th lesson. Use apps for work that will help you gather everything in one place, communicate with your team and remind yourself about taking breaks from the computer. Manage your time wisely and deal with distractions. I hope that after trying some of the apps that will help you set goals and organize your time, you won’t wish the day would have more hours, but you will be happy when the clock shows “bed time” and you happily disconnect. Rise and shine the next day, ready to be productive again.